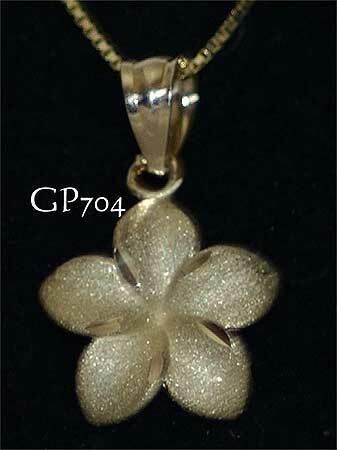 Solid 14 carat yellow gold Hawaiian Plumeria (frangipani) pendant. Curled petal flower featuring a brushed finish and diamond cut petal edges. An excellent piece of Hawaiian jewelry for weddings or any occasion. Measurements: 11mm diameter. This is old stock and now down to the last few. New stock arriving soon but will be 10mm diameter.